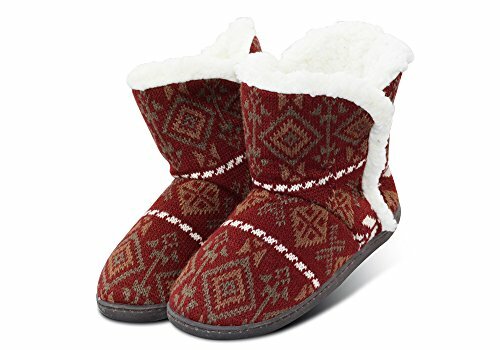 This kind of bootie slippers are designed for indoor and outdoor use. There is velvet lining providing luxury experience intead of hard touching from other shoes. Anti-skid outsole makes you walk steadily. Rubber insole prevents you from contacting hard ground directly. Knitting pattern looks elegant and attrctive. These slipper are machine washable. In order to maintain excellent perfermance, please don't put outside pressure on it. Full of terry style makes it comfortable for us to wear. The boots are machine washable. Anti-slip hard sole ensures that we can walk on the smooth floor without slipping and take a walk outside. Memory foam insole is devoted to arch support for women, especially someone has trouble with her ankle. When it gets cold, your feet are wrapped in the booties with such warm feeling.